FAQ’s Answered: 21 Reasons To Say Yes on H and No on i . Action Alert: Boycott: Stop Shopping at GAP (and Old Navy, and Banana Republic) home of Toxic Turf Proprietors. Parks are Public Property. We are Stakeholders. A reasonable response from elected and appointed officials is called for. The Coalition to Protect Golden Gate Park is grateful for the support of nearly 100,000 San Franciscans who voted to protect our world-renowned parks. We are happy that so many of those who chose to vote saw through the deceptive dirty politics perpetrated by those who wish to turn our parks system into franchises of pay-to-play venues controlled by elite interests with close ties to City Hall. The day after Election Day, private contractors, with the blessing of the Recreation and Park Department and operating under the direction of the City Fields Foundation (one of Rec and Park’s private partners) began the destruction of the western end of Golden Gate Park. Seven generations of sweat and toil building soil out of shifting sands were turned into a demolition zone as heavy equipment operators slashed gaping holes in woodland habitat and cut down mature trees to make room for something akin to a tumor to be implanted in Golden Gate Park. Behind an illegal fence surrounding another illegal fence the work continues–without further public process or public input. Rec and Park management cares little about either of those things. What the Department cares most about is money. That much is clear. When it comes to nickels and dimes, Rec and Park management seems comfortable trading public health and safety for a shot at the CalRecycle Toxic Turf lottery where winnings go into whatever pet privatization project is close at hand. These questions are fairly representative of pressing concerns. These sorts of concerns cannot be eliminated by political/electoral theater. The Coalition to Protect Golden Gate Park supports the initiative of individuals in what is truly a grassroots movement. Some have chosen to continue the fight beyond the election cycle. Hard questions will be asked of our elected and appointed officials. Some of those questions they will be hard-pressed to answer. Those who should be held accountable will be held accountable. A continuing Action is planned for Sundays 11am-1pm in front of McLaren Lodge until we get some good answers. A court hearing was originally scheduled for Friday, November 14 for charges leading to Kathleen McCowin’s arrest and incarceration. The Coalition to Protect Golden Gate Park applauds the District Attorney’s decision not to press charges. The ongoing destruction of Golden Gate Park by private contractors under the direction of the City Fields Foundation is illegal. The City Fields Foundation, San Francisco Recreation and Park Department’s private partner in toxic turf constructions in our Parks and Playgrounds, has violated the partnering provisions of the contract with the City. The public has not been invited to meet with contractors or project managers to discuss the details, scope, or timeline of the project at the Beach Chalet Fields. Apparently, we are no longer “stakeholders” in Our Parks. They no longer belong to us. Ms. McCowin’s statement is a bellwether in The Real Synthetic Turf War of San Francisco. Kathleen McCowin was arrested today, Friday, at 2:30 pm for blocking heavy equipment involved used by private contractors in the illegal destruction of Golden Gate Park. Ms. McCowin was taken to County Jail where she will be held until her release can be arranged. She will meet with counsel Saturday at 8:30 am. The Beach Chalet Fields are fields of play for athletes of all ages. They are directly over the City’s Groundwater Supply to be mixed with Hetch Hetchy water for us to drink. 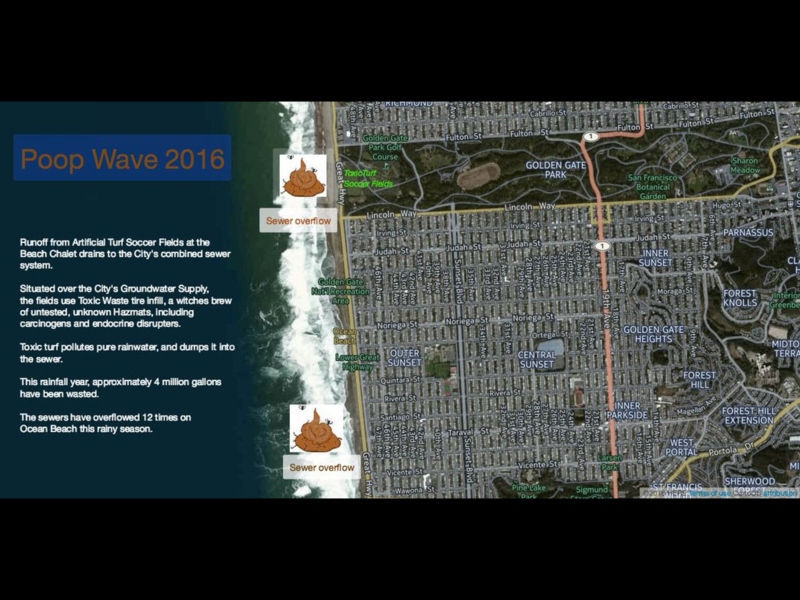 As part of the artificial turf project the City and their private partner, the City Fields Foundation proposes to dump 700,000 pounds of environmental toxins in the form of waste tire crumb infill in our beloved Golden Gate Park. We applaud Ms. McCowin’s resolve to stop this horrible project. Ms. McCowin will issue a statement to the press upon release. Kathleen McCowin on NBC News on Thursday evening. including Our Golden Gate Park. Rational People have known all along that 7 1/2 acres of plastic carpet with 700,000 pounds of toxic waste over our Groundwater supply in Golden Gate Park is an ill-conceived plan. Just say NO to Prop I, Poisonous to our Urban Environment and the Democratic Process. Rec and Park and their Private Partners want NO Process. That’s wrong. We say– I…NO. YES, on H! Real Grass is Alive, Organic, and Green. Toxic Turf is harmful to our unique Urban Environment and all Animals…including human beings. Artificial Nightime Sports Lighting on all night every night until 10pm is equally Anti-Environmental and Wasteful…like a gigantic neon sign that reads RENT ME. Prop H says keep it Real with Real Grass in Golden Gate Park and no nighttime sports lighting. San Francisco Says YES ON H! Artificial Turf w/ waste tire infill fields constructions in Ocean City, NJ and Burien, WA. have been Canceled! In the wake of last week’s report by NBC News investigating the health and safety risks of Artificial Turf, other cities have canceled plans to install toxic artificial turf. Stop the the construction of a 7 1/2 acre toxic artificial turf fields complex in our world-renowned Golden Gate Park. Protect our Athletes Young and Old. Protect Our Park from Rec & Park and their private construction partner, City Fields’, privatization scheme. Don’t let SF Kids’ Play be privatized! Vote to maintain real natural grass fields in Golden Gate Park. Let’s Keep it Real. HELP SAVE GOLDEN GATE PARK’S BEAUTIFUL AND WONDERFUL RECREATIONAL SPACES BY KEEPING THEM NATURAL. 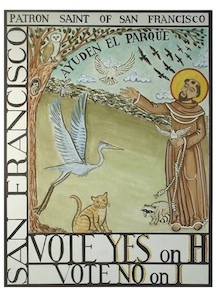 Vote YES on “H” for Healthy kids, sports, a Healthy environment and a Healthy Golden Gate Park! Rec and Park wants to pave Golden Gate Park’s Beach Chalet grass fields with 7 acres of artificial turf and install 150,000 watts of environmentally damaging sports lighting. The lighting will be on until 10pm every night. The “rubber crumb” turf consists of ground-up tires and plastic. artificial turf makes noxious fumes and water that falls on fake fields has to be treated with sewage at the Wastewater treatment plant. The Rec and Park department (RPD) has failed to follow it’s own Golden Gate Park Master Plan which states that the western edge of the park remain in a natural state. RPD is trying to privatize public assets—the Beach Chalet athletic fields—so that they can make money on permits and tournaments. After 7:00pm the fields will be used almost exclusively by adults, many nonresidents. Our kids deserve real grass! Prop H supports renovating the Beach Chalet fields with real grass and state-of-the-art playing fields construction! Good soccer players prefer real grass. Our kids deserve the best! Rec and Park already has $5 million from 2008’s Bond for a Real Grass renovation and amenities. We can protect Golden Gate Park AND give kids more hours of play! YES on “H” – Protect Golden Gate Park for kids today and for future generations! (VOTE NO on “I” – the park’s poison pill)! 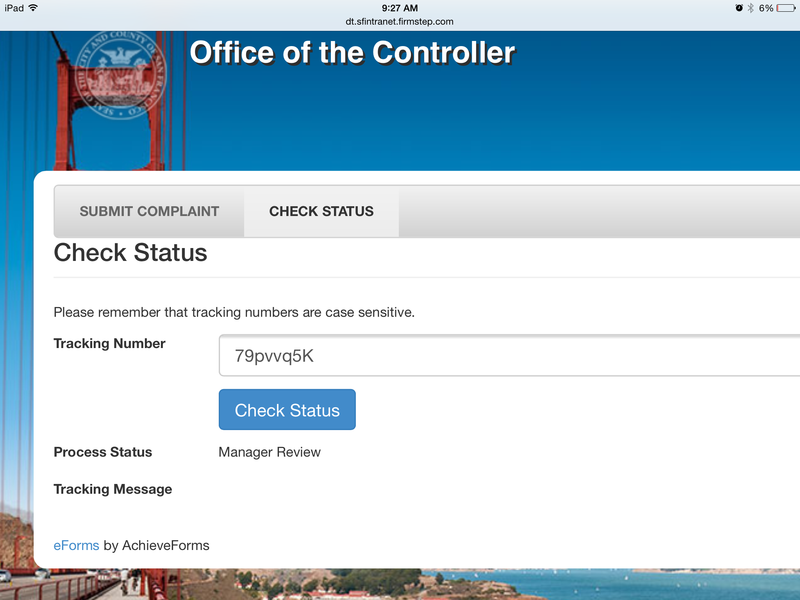 On July 22, 2014 the San Francisco Department of Elections certified petitions submitted by the Coalition to Protect Golden Gate Park and qualified their Citizen’s Ballot Measure Initiative for the November, 2014 election. The initiative provides that all athletic fields west of Crossover Drive in Golden Gate Park would be renovated with natural grass and high-intensity sports lighting would not be permitted. This Citizens’ Ballot Measure action is the culmination of years of work by many San Franciscans who have worked to stop the replacement of the Beach Chalet soccer fields at the western edge of Golden Gate Park with plastic artificial turf, rubber tire crumb padding, and high intensity sports lights. Despite evidence that the fields pose significant health and environmental risks, concerns that significant light pollution from night sports lights will impact wildlife and make it impossible to enjoy a starry night in this area, and a law suit that is currently in the California Court of Appeal, the City continues to insist on installing these fields. In response to this initiative effort, five members of the San Francisco Board of Supervisors signed off on a counter measure to permit the Recreation and Parks Department to build the industrial sports complex. But the City’s vague measure does not just target the Beach Chalet fields, it would increase the Recreation and Parks Department’s administrative authority to build anywhere in the City, and subvert existing legal processes to do so. Their proposal raises many unanswered questions about the Recreation and Parks Department’s commercialization of public space and disenfranchisement of the City’s voters. A Ballot Initiative has been filed to protect the western end of Golden Gate Park by requiring that the renovation of the Beach Chalet Soccer Fields be done using natural grass not toxic turf and prohibiting tall stadium lighting. Supporters believe they have submitted more than enough signatures on petitions to qualify for the November 2014 ballot but now have to wait for the Department of Elections to validate these signatures. They believe this issue must be taken to the voters because the decision-makers in the City and the California Coastal Commission disregarded a wealth of information about the harmful effects of artificial turf, night lighting, and the inappropriateness of a sports stadium in the naturalistic western end of Golden Gate Park. Thousands of concerned residents signed petitions, wrote letters, testified at hearings, and publically protested the Beach Chalet project. Nevertheless, the decision-makers turned a deaf ear to this outcry and are allowing the project to go forward. The Coalition to Protect Golden Gate Park is the grassroots organization that is putting this ballot initiative forward. They are dedicated to keeping Golden Gate Park safe, naturalistic, and free of toxic materials. This initiative will allow voters to decide whether a 7+ acre grass playing field at the Beach Chalet Fields should be bulldozed and replaced with artificial turf pavement, lighted every night of the year with tall stadium lighting, or whether the fields will be maintained as natural grass and host sporting events in a natural context as they have been since the 1930’s. This initiative would also affect any future project at the Polo Fields. • the precedent for the rest of the California Coast set by the California Coastal Commission’s ruling approving the plan. The November 2014 Ballot Measure. All athletic fields in Golden Gate Park in the area west of Crossover Drive shall be maintained as natural grass. The City shall not permit nighttime sports field lighting in these areas. Appendix 103 is added to the San Francisco Administrative Code as follows: All athletic fields in Golden Gate Park in the area west of Crossover Drive shall be maintained as natural grass. The City shall not permit nighttime sports field lighting in these areas. In accordance with the provisions of California Elections Code section 9217, if a majority of the voters vote in favor of the Initiative, the Initiative shall go into effect 10 days after the vote is declared by the Board of Supervisors. If any provision of this Initiative or any application thereof to any person or circumstance is held invalid, such invalidity shall not affect any provision or application of this Initiative that can be given effect without the invalid provision or application. To this end, the provisions of this Initiative are severable.